My sister and I made this cake the day before Easter Sunday and let it sit in the refrigerator until we served it for dessert... it was WONDERFUL!!! 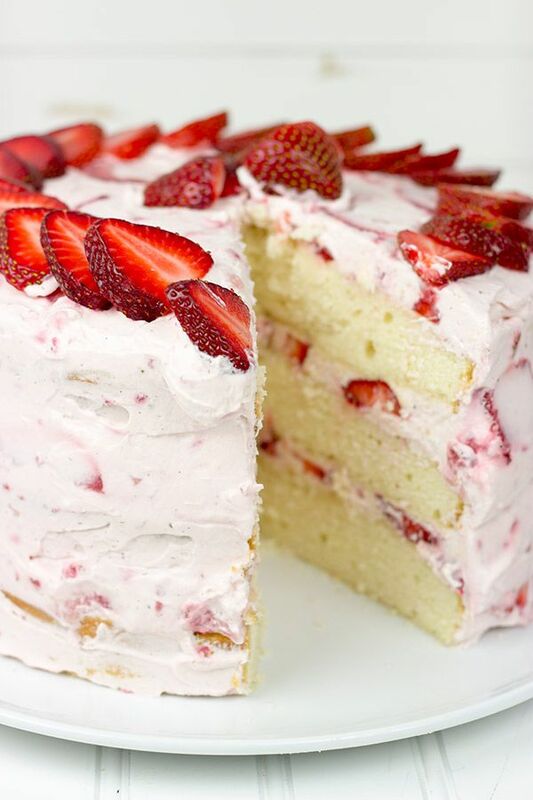 We took three recommendations from reviews that really helped the strawberry cake to turn out great! 1~ We seperated the egg whites and yolks and whipped the egg whites and then added them in to the mixture. 2~ Also we sifted the flour and then after sifting measured it again. 3~ We spread strawberry puree in between the two cake layers along with icing to make them stick together well. (mmmmm!!! :D)Furthermore we made the strawberry puree by blending clean, cut strawberries together in the blender which made a really fresh puree. As a finishing touch, after icing the entire cake with vanilla icing, we placed extra sliced strawberries on the top of the cake! The cake was BIG hit but make sure to make room in the refrigerator for leftovers!